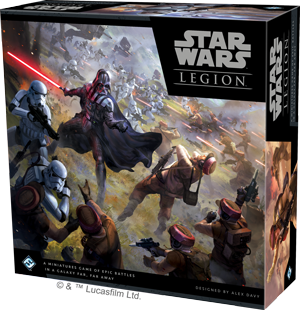 Star Wars: Legion is played over the course of six rounds as you and your opponent duel over objectives on a battlefield of the Galactic Civil War. At the end of six rounds, the player with the most victory tokens (earned from objectives) wins the game. Naturally, the first step in destroying your opponent on the field of battle and completing your objectives is to deliver orders to your units. Every unit in your army will activate each round, whether it receives orders or not, but giving orders to a unit gives you a powerful level of control over when that unit activates, as you’ll see below. The first part of giving orders to your troops is to select a command card. Each player starts the game with a hand of seven carefully chosen command cards. In the command phase (the first phase of each round), you and your opponent each select one of your available command cards and reveal it simultaneously. Command cards, like the one shown above, represent the tactics you employ as you give orders to your units. All command cards have a few vital pieces of information. In the upper-left corner of the card, you’ll see a number of pips—whichever player revealed the command card with fewer pips acts first throughout the round. Your command card also lets you issue orders to your units—for example, the command card shown above lets you issue orders to two of your units in proximity to one of your commanders. 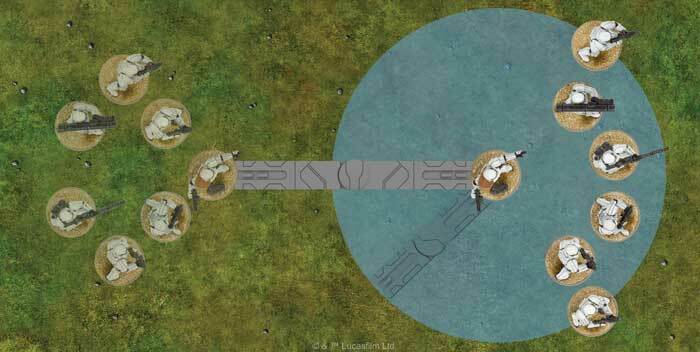 Every unit in your army has a corresponding order token showing that unit’s rank symbol. To issue orders to a unit, you simply take an order token matching that unit’s rank and place the order token next to your unit on the battlefield, as shown in the diagram below. 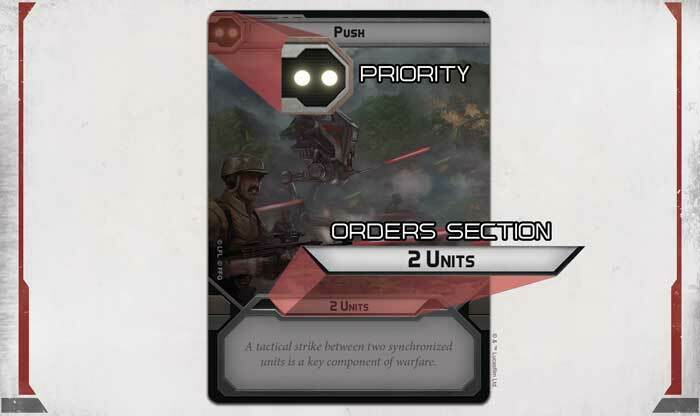 Using the Push command card, you deliver orders to two units within Darth Vader’s command radius: Darth Vader himself and a unit of Stormtroopers. The other unit of Stormtroopers is outside Vader’s command radius and cannot be ordered. 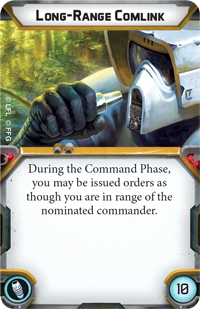 The Speeder Bikes could receive an order with this card, but you’ve decided giving orders to your other units is more advantageous. After you’ve issued orders with your command card, you’ll take your unassigned order tokens and randomize them by placing them in a bag or shuffling them facedown. Players will then alternate activating units, and each time it’s your turn to activate a unit, you have a choice—activate one of the units that you ordered in the command phase or draw a random token from your order pool. If you choose to draw a random token, you can activate any unit with the rank shown on the order token. You have drawn a random order token showing the corps rank. You can activate any unit that shares that rank, including either of the two Rebel Trooper units shown above. Ordering your units in the command phase, therefore, is critical to ensuring your plans go off flawlessly. 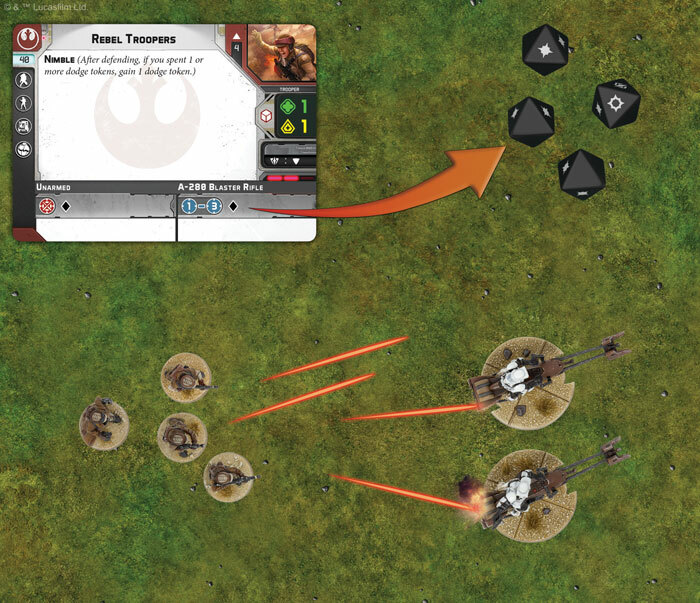 If you’ve ordered a unit, you can activate them whenever you choose; whether that means launching a stunning attack before your opponent’s Stormtroopers adjust formation or holding back your AT-RT until your opponent moves forward. Every battle has an ebb and flow as players order units and your troops march across the battlefield. Mastering the command system and choosing which units to activate and when to activate them is essential if you’re going to outmaneuver your opponent and create an advantage for your forces! Your orders are essential, but battles are not solely won by the command card that you play and the units that you order. They’re won by the troops on the ground, and how you move and attack with those soldiers. During the activation phase, you and your opponent alternate activating units—either by choosing a unit that you ordered in the command phase or by drawing a random order token from your order pool. Whether your unit is a pair of lightning-fast 74-Z Speeder Bikes or a squad of Rebel Troopers, every unit has two actions to use. Your troops can march across the battlefield, attack the enemy, take careful aim, dodge enemy fire, or take a moment to recover. You may even hold your action and move or attack a later time if an enemy unit is unwise enough to approach! Each of these actions is useful at different times, but the two actions that you’ll use most are moving and attacking. 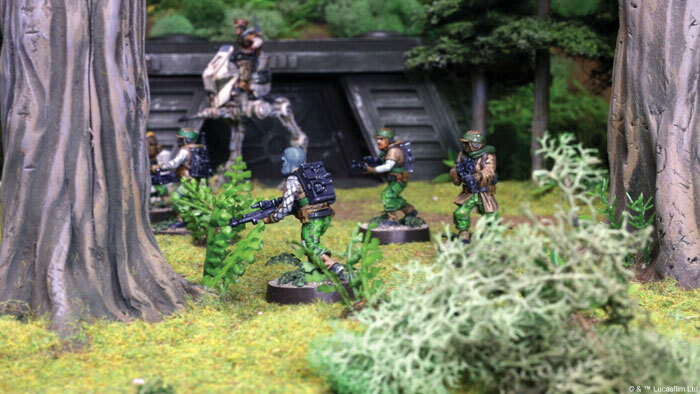 Movement in Star Wars: Legion is fast and organic as you send your troopers marching forward. Every unit has a speed which determines the jointed movement tool that you’ll use to move that unit. You simply align the movement tool with the base of the unit leader and move it to the end of the movement tool. 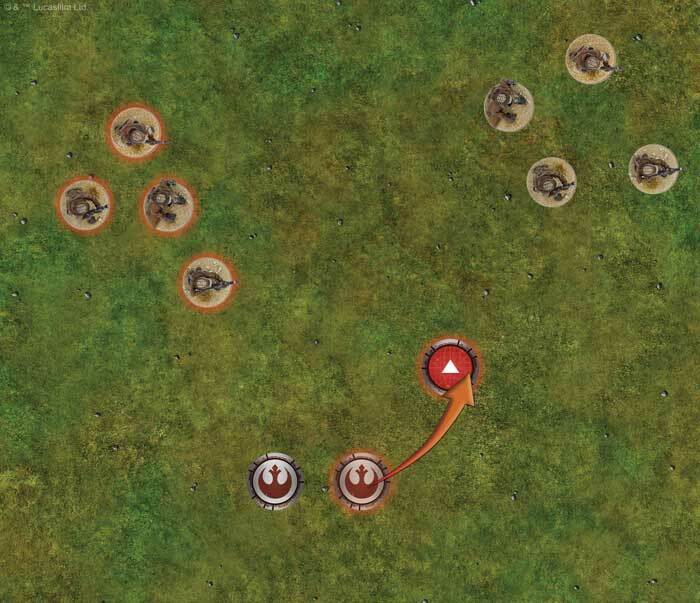 The Stormtroopers unit leader is moved using the movement tool, and then all other minis in the unit can be placed in cohesion with the leader. Unlike many miniatures games, you don’t need to measure movement for each mini in the unit! Once the unit leader has moved, you can pick up the remaining minis and place them in cohesion with their unit leader—anywhere within a speed-one move of the unit leader. Not only does this keep movement fast-paced and interesting, it lets you quickly and tactically position your unit to take advantage of any cover or terrain that’s placed on the battlefield. Moving your units into position is vital for claiming victory in Star Wars: Legion, and the exact positioning of every miniature is crucial. The position of every unit on the battlefield is open information—what you need to plan for is how your opponent can use those units! Good positioning and the ability to read the battlefield could allow you to catch your opponent in a deadly crossfire or pin an enemy unit between two of your own. Attacking your enemies and destroying them is just as important as movement and positioning in Star Wars: Legion. 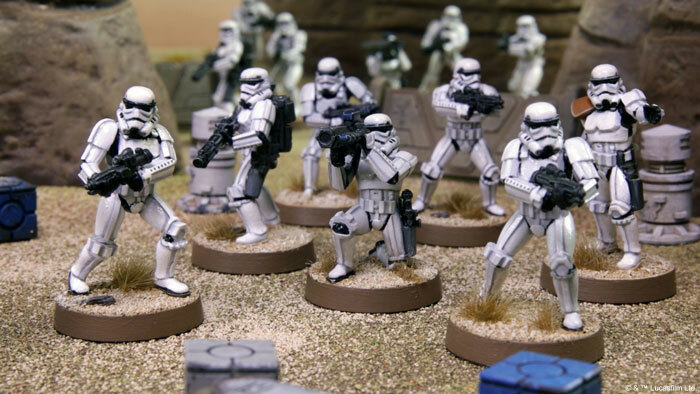 A squad of Stormtroopers may be firing their E-11 Blaster Rifles or Luke Skywalker may be fighting with Anakin’s Lightsaber, but no matter which unit is making the attack, every miniature in the unit has something to contribute. At the bottom of every unit card, you’ll see one or more weapons listed, along with the range of that weapon, dice rolled during an attack, and the weapon’s special abilities. When you make an attack, you choose the weapons used by each miniature in the unit and add the dice together. For example, a unit of four Rebel Troopers is attacking an enemy unit. All four Rebel Troopers are using their A-280 Blaster Rifles. Each A-280 Blaster Rifle contributes a single black attack die, so you gather four black attack dice (one for each Rebel Trooper firing an A-280 Blaster Rifle in the unit) and roll them! After you’ve rolled your attack dice, your opponent will roll a defense die for each hit, potentially allowing damage to be removed by cover or armor. Any shots that hits your opponent’s unit causes wounds and remove soldiers! Even if an attack does not deal damage to your target, just coming under blaster fire is detrimental to a unit’s morale. 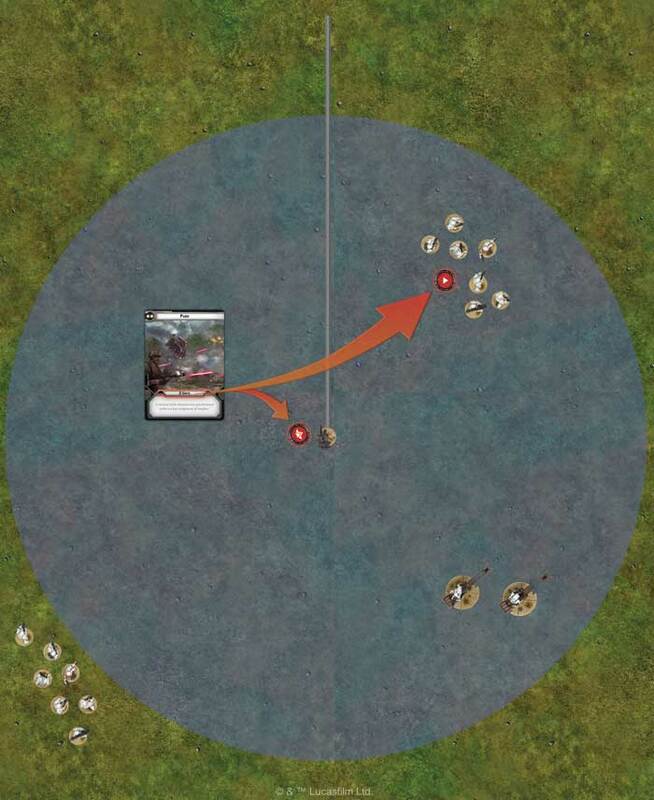 Any unit targeted by a ranged attack must take a suppression token after the attack resolves. 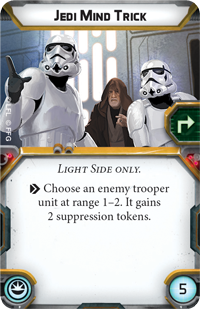 Suppression tokens represent your troopers hitting the dirt and taking cover to avoid blaster fire—although suppression increases cover against ranged attacks, it also limits the number of actions a unit can perform! If your unit takes too many suppression tokens without removing them, it may even break and flee. Ultimately, Star Wars: Legion is more than just a game—it’s an invitation to create an army that only you could have built, gathering troopers, vehicles, and iconic characters from the Star Wars saga and pitting them against your opponent’s army in battle. The first step in building your army is to select your side and choose the units that will make up your army. 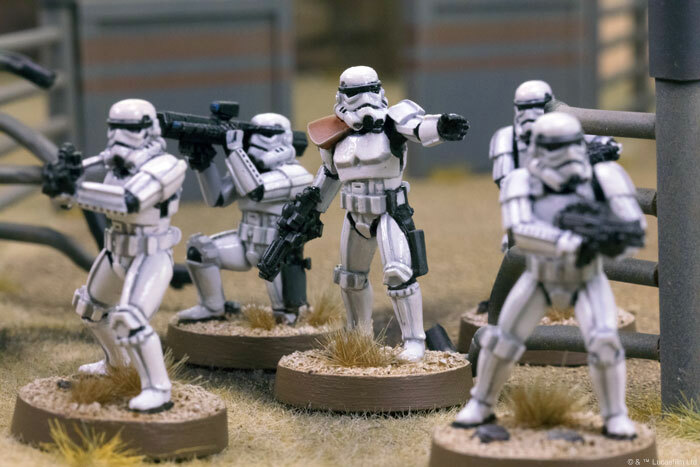 Even within the Core Set, you already have impactful choices to make with units of Rebel Troopers and Stormtroopers, along with 74-Z Speeder Bikes, an AT-RT, Darth Vader, and Luke Skywalker. You may be planning to play out a small-scale skirmish between just a few units or a massive battle, but either way, the units that you choose are the foundation of your army. The choices don’t stop once you’ve chosen your units, either. Every unit in the game has one or more upgrade slots for you to equip upgrade cards that tweak and customize your unit’s battlefield role. 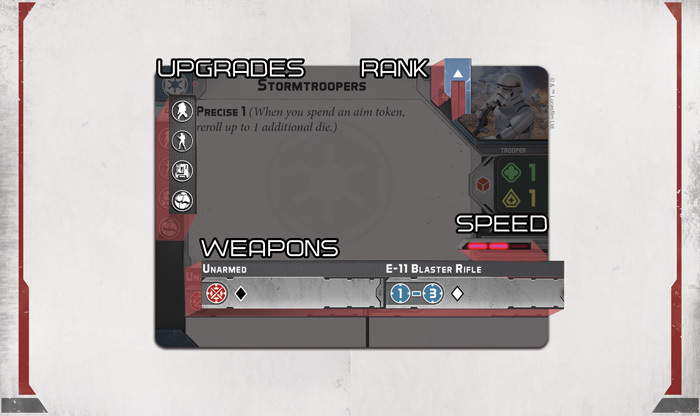 Whether you upgrade Luke Skywalker with the ability to use a Jedi mind trick, load a rotary blaster onto your AT-RT, or hand your troopers concussion grenades, every upgrade card makes your army more unique. The choices that you make when choosing your units and equipping upgrade cards are the first step to gaining the competitive edge over your opponent. And of course, perhaps the most entertaining way you can customize your army is by painting and customizing your miniatures! 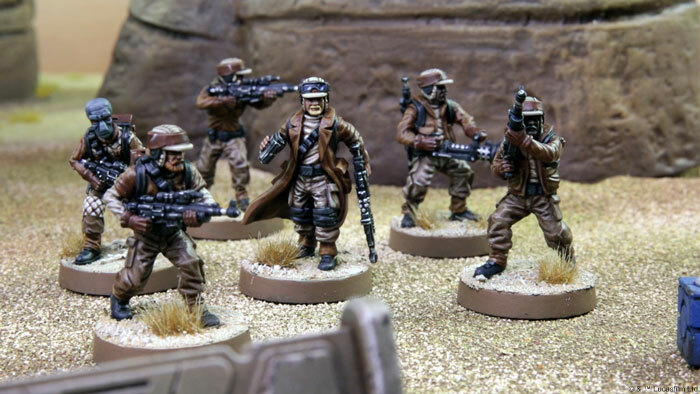 All Star Wars: Legion minis come unpainted, so after you assemble your army, you’ll be able to paint your miniatures into something that only you could have created. 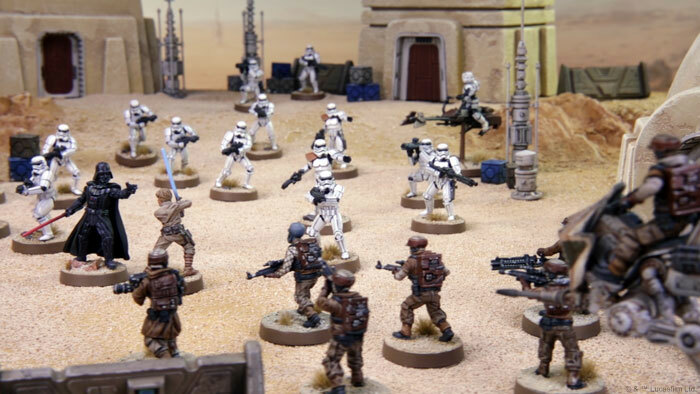 Although you don’t need to paint your miniatures, many players find it more enjoyable to play with a painted army, and even if you’ve never painted an army of miniatures before, Star Wars: Legion is the perfect introduction to the hobby. Keep an eye on the support section below for Star Wars: Legion painting tutorials. 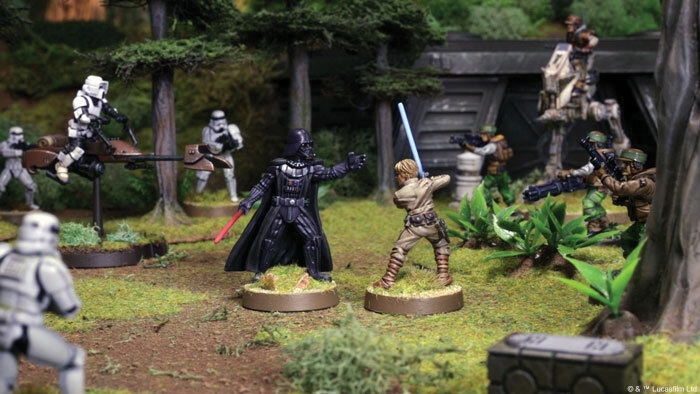 A world of thrilling Star Wars infantry battles is yours to experience. Build your armies, take command, and conquer your rivals with Star Wars: Legion!